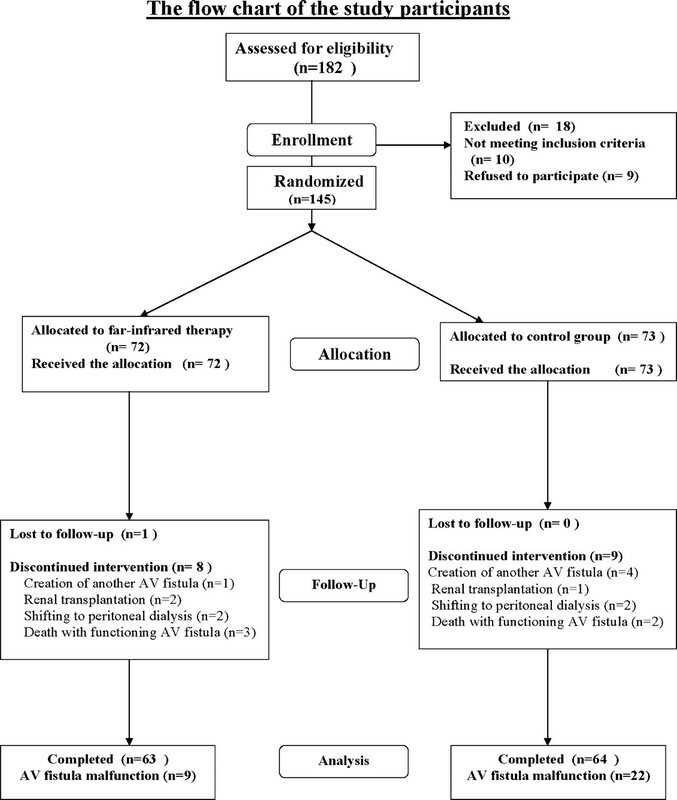 Flow chart of the study participants for the randomized, controlled trial to evaluate the effect of far-infrared (FIR) therapy on survival of arteriovenous fistula (AVF) in the hemodialysis (HD) patients. 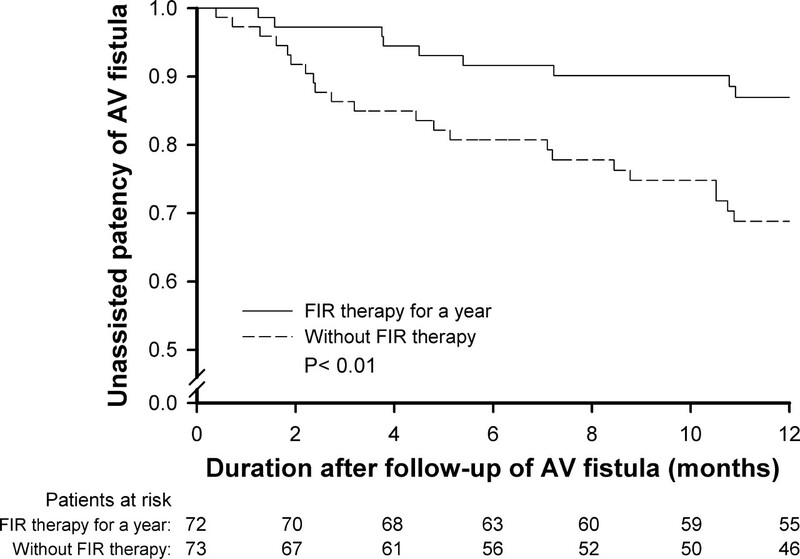 Comparison of 1-yr survival curves for unassisted patency of AVF between the HD patients with or without FIR therapy. P < 0.01 for the comparison between the two survival curves by log rank test. ↵a CO, cardiac output; Qa, access flow; SBP, systolic BP; TPR, total peripheral resistance; 1, timing of measuring the parameter is within the first hour after initiation of HD session or immediately before FIR treatment; 2, timing of measuring the parameter is 40 min after timing 1 or immediately after FIR treatment. Boldface P values indicate P < 0.05. ↵a Qa1, access flow measured within first hour after the initiation of the HD session immediately before the commencement of this study; Qa2, access flow measured 40 min after Qa1 measurement during the HD session immediately before the commencement of this study; Qa3, access flow measured before FIR treatment or within first hour after the initiation of the HD session when the study was completed; Qa4, access flow measured 40 min after Qa3 or immediately after FIR treatment during the HD session when the study was completed; Δ(Qa4 − Qa3), sum of the thermal effect by FIR and the hemodynamic effect by HD on the change of Qa; Δ(Qa3 − Qa1), nonthermal effect of 1 yr of FIR on the change of Qa; Δ(Qa4 − Qa2), sum of the thermal effect (for 40 min) and the nonthermal effect (for 1 yr) by FIR on Qa; [Δ(Qa4 − Qa2) − Δ(Qa3 − Qa1)], thermal effect of 40 min of FIR on the change of Qa.